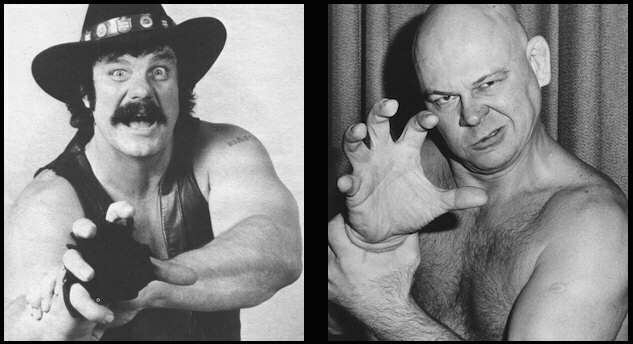 By the late summer of 1978, two of the biggest names in professional wrestling, Blackjack Mulligan and Baron von Raschke, had been for the most part going their separate ways in the Mid-Atlantic area for about a year. That was all about to change during an eventful edition of the Mid-Atlantic Championship Wrestling television program that was taped on September 6, 1978. The beginning of that TV show started off with a figurative "bang," as Paul Jones and Ricky Steamboat were shockingly forced to relinquish their World Tag Team Title belts to Raschke and Greg Valentine on the program's first segment via a pronouncement by NWA President Bob Geigel. But following that blockbuster announcement, Baron von Raschke hung around to give the show a literal "bang" immediately following. Unfortunately that loud bang was a blow to Blackjack Mulligan's noggin. Announcer Bob Caudle summoned the big man from Eagle Pass, Texas saying, "I have Blackjack...come on out here Blackjack. All right fans, this is Blackjack Mulligan, Blackjack come on in because we've got a special presentation to you...David." 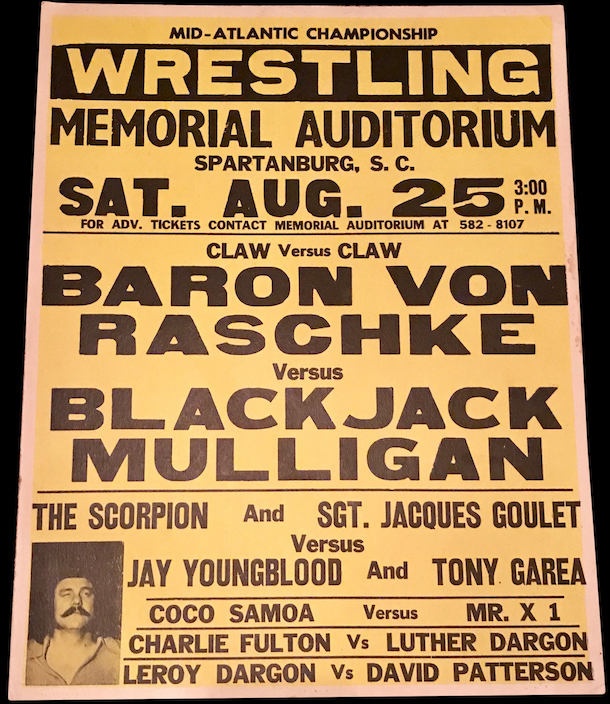 Color commentator David Crockett reappeared on the set with a large trophy and approached Mulligan saying, "On a much pleasanter note, Jack, it says from the fans of the Mid-Atlantic area, to Blackjack Mulligan, Outstanding Wrestler of 1977-78. Blackjack, from the wrestling fans of the Mid-Atlantic area." Mulligan appeared to be very moved by the award and began to comment, "I tell you what, thank you very much David..." Then in a split second, Raschke and Greg Valentine appeared back on the set and attacked Mulligan viciously. The Baron was the primary aggressor, grabbing the trophy and breaking it squarely over Blackjack's head! The crowd in the studio audience was almost in riot mode at this shocking turn of events! Caudle exclaimed, "Hey, [the Baron] just went wild and is tearing it up! He hit Blackjack across the head with it David, and they're both on him, slammin' him around over there." Crockett yelled in response, "Raschke's just gone completely berserk!" Caudle continued, barely audible over the boisterous crowd, "He said what do you mean, [Mulligan's] not the outstanding that he is the outstanding and that he is the champion. And he continues to stomp and kick at Blackjack Mulligan!" A hysterical Raschke then interjected maniacally, "That will give me part of the $10,000.00 bounty, Blackjack Mulligan!" As Mulligan attempted to gather himself, Caudle repeated, "He says that will give him part of the $10,000.00 bounty, David. And Blackjack, who is reeling...and I tell you, that is one of the lowest blows I have ever seen anybody get! What a blow, just to walk in and grab you that way!" Blackjack still woozy and staggering from the blows to the head managed to say, "Raschke, you're gonna pay for this like you've never paid before...I'll tell you right now." Caudle ended the segment, concluding, "David, you have to call that a sneak attack in any way you look at it...a sneak attack! Trophy in pieces!" On the final segment of that September 6, 1978 Mid-Atlantic TV show, concerned fans were gratified that Mulligan returned to the set to address them. Bob Caudle began, "Fans with us right now at ringside and a fellow I'll tell you that has taken more than his share of punishment in the last hour or so...it seems like everybody in the world wanted to stomp and kick and cut and rip at you, Blackjack Mulligan." Blackjack answered, "Let me tell you something Bob Caudle; I want to talk to the people right now." Mully continued as he held up the pieces of his destroyed trophy noting, "Everybody in television-land looking at me right now, I know this is a very nice gesture and I certainly appreciate it and I know there was probably a lot more deserving people in the world of wrestling. But I appreciate what you tried to do; what you tried to give me. But I seem to be a marked man in the world of wrestling . Everything I do, everything I try to do, Ric Flair or Raschke or Superstar or some of their henchman are right in the way. I appreciate this trophy being given to me by the people of Mid-Atlantic Wrestling." Blackjack concluded the segment with a dire warning for the big German threatening ,"And I wanna tell you something Raschke...my head, I've never had a rougher hour in my whole life. But I wanna tell you something right now...I'm still standing here. I need my head sewed up, but I haven't fell yet! And Baron von Raschke, believe what I say, if it takes Claw against Claw my friend...your day is coming! We're marking von Raschke as NEXT!" During the remainder of September and during October of 1978, these two world renowned grapplers who both used the dreaded Claw hold as their respective finishing maneuvers, battled frequently around the territory in a spirited but short program. Some of the bouts were even billed as Claw vs. Claw matches. Mulligan emerged victorious in a majority of these fiercely contested battles, and was the clear winner in the Texas Death Matches and Bounty matches between the two. The Baron scored his wins mainly in straight up bouts without stipulations. The confrontations between the masters of the Claw were cut short when Big John Studd entered the Mid-Atlantic area in October, and became Blackjack's primary adversary as John pushed hard to collect the long-standing $10,000.00 bounty on Mully. The Baron was also pulled away from the program with Mulligan when Paul Orndorff and Jimmy Snuka entered the Mid-Atlantic area at the end of October and made an immediate push for the Baron and Greg Valentine's World Tag Team Titles. While Blackjack Mulligan got a measure of revenge for Baron von Raschke destroying his trophy upside his head on TV, I always wished that these two would have had a longer program against each other. While Claw versus Claw was red hot for a short time, these two developed other irons in the fire with Mid-Atlantic newcomers that would ultimately define the Claw versus Claw program as a transitional bridge on the roads to even bigger Mid-Atlantic feuds for these two Jim Crockett Promotions mega-stars.